Slump is a measurement of concrete's workability, or fluidity. It's an indirect measurement of concrete consistency or stiffness. The mould must be firmly held against its base during the entire operation so that it could not move due to the pouring of concrete and this can be done by means of handles or foot - rests brazed to the mold. The decrease in height of concrete to that of mold is noted with scale. (usually measured to the nearest 5 mm (1/4 in). In order to reduce the influence on slump of the variation in the surface friction, the inside of the mould and its base should be moistened at the beginning of every test, and prior to lifting of the mould the area immediately around the base of the cone should be cleaned from concrete which may have dropped accidentally. If one-half of the cone slides down an inclined plane, the slump is said to be a shear slump. This is the only slump which is used in various tests. Mixes of stiff consistence have a Zero slump, so that in the rather dry range no variation can be detected between mixes of different workability. However , in a lean mix with a tendency to harshness, a true slump can easily change to the shear slump type or even to collapse, and widely different values of slump can be obtained in different samples from the same mix; thus, the slump test is unreliable for lean mixes. The slump test is used to ensure uniformity for different batches of similar concrete under field conditions and to ascertain the effects of plasticizers on their introduction. This test is very useful on site as a check on the day-to-day or hour- to-hour variation in the materials being fed into the mixer. 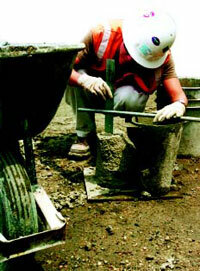 An increase in slump may mean, for instance, that the moisture content of aggregate has unexpectedly increases. Other cause would be a change in the grading of the aggregate, such as a deficiency of sand. Too high or too low a slump gives immediate warning and enables the mixer operator to remedy the situation. 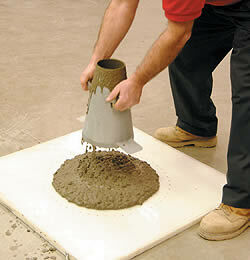 This application of slump test as well as its simplicity, is responsible for its widespread use. Very dry mixes; used in road making. Roads vibrated by power operated machines. Low workability mixes; used for foundations with light reinforcement. Roads vibrated by hand operated Machines. Medium workability mixes; manually compacted flat slabs using crushed aggregates. 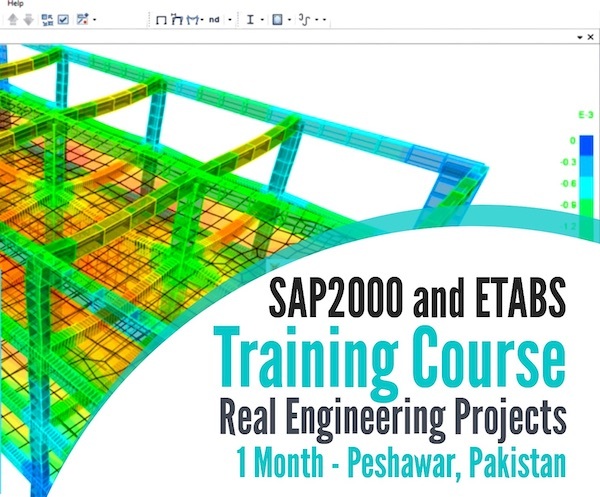 Normal reinforced concrete manually compacted and heavily reinforced sections with vibrations. Table : Workability, Slump and Compacting Factor of concrete with 19 or 38 mm (3/4 or 11/2 in) maximum size of aggregate. The slump test is referred to in several testing and building code, with minor differences in the details of performing the test. In the United States, engineers use the ASTM standards and AASHTO specifications when referring to the concrete slump test. The American standards explicitly state that the slump cone should have a height of 12-in, a bottom diameter of 8-in and an upper diameter of 4-in. The ASTM standards also state in the procedure that when the cone is removed, it should be lifted up vertically, without any rotational movement at allThe concrete slump test is known as "Standard Test Method for Slump of Hydraulic-Cement Concrete" and carries the code (ASTM C 143) or (AASHTO T 119). In the United Kingdom, the Standards specify a slump cone height of 300-mm, a bottom diameter of 200-mm and a top diameter of 100-mm. The British Standards do not explicitly specify that the cone should only be lifted vertically. The slump test in the British standards was first (BS 1881-102) and is now replaced by the European Standard (BS EN 12350-2). What is the ideal value of slump? In case of a dry sample, slump will be in the range of 25-50 mm that is 1-2 inches. But in case of a wet concrete, the slump may vary from 150-175 mm or say 6-7 inches. So the value of slump is specifically mentioned along the mix design and thus it should be checked as per your location. How does a super plasticizer effect the slump of concrete? Value of Slump can be increased by the addition of chemical admixtures like mid-range or high-range water reducing agents (super-plasticizers) without changing the water/cement ratio. How much time one should take to raise the cone? 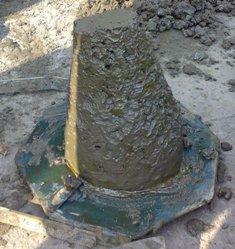 Once the cone is filled and topped off [ excessive concrete from top is cleared ] raise the cone within 5-10 seconds. What are the dimensions of the cone used in Slump Test?